Consideration #1: How can I use my blog to promote my offerings? 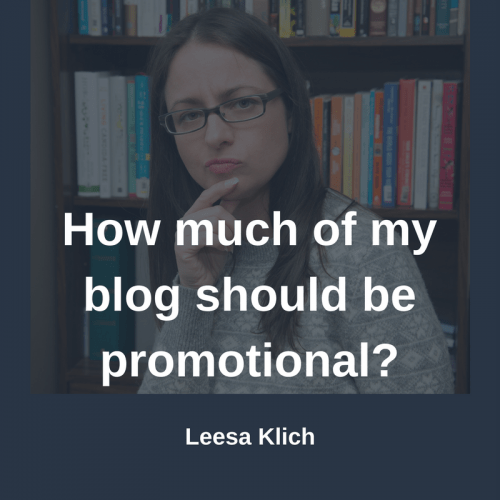 But, what if my promotion is time-limited, but my blog isn’t? Consideration #2: What do you want to promote? Question #1: How does it make you feel? Question #2: How does your audience receive your promotional posts? Signing off and toasting: To finding your perfect balance between informational and promotional blog content. This question came to me in a live group chat a couple of weeks ago. And what a great question this is! We’ve all seen blogs (and vlogs, and podcasts) that we love. Ones we learn a tonne from and keep going back to over and over again. We’ve also seen many that promote ad nauseum and turn us right off. #Amirite? As wellness practitioners we want to be authentic and demonstrate our expertise. We want to be known, liked, and trusted. We want to be seen as thought leaders in our niches. These are where informational blog posts come in. We also all want to reach and serve more people. We want to inspire a growing audience. And we want our businesses to be profitable, so we can continue doing our wellness work in the world. These are where promotional posts come in. The first consideration is how can we use promotion in our blog? Some ways are subtle, others are super-salesy. You don’t have to change from 0 to 100 overnight. I promise. The next thing to consider is what we are promoting. Is it a free opt-in incentive to build our email list? Is it a low-cost, entry-level item? Or are we planning an entire content marketing launch strategy for a new big-ticket item? Lastly, we’ll talk about the “should.” I’ll give you two key things to consider before deciding which, if any, of the “how’s” and “what’s” are right for you. Your online content (a.k.a. “content marketing”) consists of your blog + newsletter + social media + advertising. Today I’m only talking about your blog. Your blog is part of your “home base,” your website. The newsletter you send to your email subscribers probably includes a link to your latest blog post. Your social media posts come and go through people’s newsfeeds. They’re much shorter-term than your blog posts. In fact, you should schedule many, many social media posts for each and every blog post you write. (More on that in an upcoming blog post). And, when it comes to advertising… well, that ends abruptly when you stop paying. It’s very temporary, unless you plan a long-term financial investment. This is why I look as your blog as the foundation for your content. Your social media posts & ads are fleeting, and often try to draw people to your awesome blog posts anyway (which may contain opt-in incentives to grow your email list). Your blog (or vlog or podcast) is the foundation of your content. What are the main issues people come to you for help with? Your blog is part of YOUR website, so, you can promote however you’d like (or not at all… if you’re not looking for new customers/clients). Create an entire series of posts which promote and pitch your products/services. Each post can be one tiny part of the problem, with how you can help; Don’t forget your “overcoming barriers” posts where you help guide people who aren’t yet convinced (they have “barriers”) to why they should invest with you. No problem! The most common type of blog post is called an “evergreen” post. These are posts that stand the test of time (kind of like those evergreen trees). They’re mostly informational posts, and the information you talk about in them won’t expire or change dramatically in the near future. But, not all posts need to be “evergreen.” Some can also be temporary. You can certainly plan some time-limited posts into your content marketing editorial calendar too. By the way, do you have an editorial calendar for your blog? If not, you can download mine. It’s a free Google sheet that you can save yourself a copy of. No opt-in required. It goes step-by-step how to strategize your blog content to help you meet your business goals. Now that you’ve seen a bunch of ways how to use your blog to promote, let’s look at what you might consider promoting. Your blog is public-facing, so not everyone who comes across your posts knows, likes, and trusts you. Until you build up that KLT factor, it’s going to be difficult to sell larger-ticket items without building that relationship with your audience. Give them something that will help them, but doesn’t require a large commitment of time or money. A quick win. You can start with free “opt-in incentives.” These make a lot of sense to offer something for free in exchange for the reader to opt-into your email subscriber list. In fact, a lot of people, myself included, specifically create “content upgrades” for blog posts. These are a summary, or other extension (or upgrade) of the information in the blog post. They allow the reader to either download a snapshot, dig deeper, or implement what they’re learning from reading your post. You can also consider promoting what’s called a “tripwire.” Tripwires are inexpensive mini-products, like a $7 or $17 item that you can promote in your blog. They are low-cost entry-level items. Sometimes they’re a digital download, access to a webinar or short training, or even the shipping costs on a new hardcover book. This way, you can charge a small bit for an item can directly help the person take the first step to success in working with you. These are examples of free or inexpensive things that you can easily promote on your blog. When it comes to higher-priced items, this is where a blog strategy comes in. In order to build up your KLT (know, like, and trust) factor for these more expensive products and services, it’s recommended that you create a series of blog posts (and corresponding newsletters and social media posts) that, over the course of several weeks, lead up to your large promotion. If one or more of the how’s or what’s mentioned above make you feel “icky,” then don’t do it. But, if something tweaks your interest a bit, it may be worth trying. Don’t forget, as wellness practitioners and entrepreneurs, we may need to break out of our shells a bit to funnel more visibility toward our products and services. And, don’t forget. Your blog is yours. You can try things, change things, and delete things as you see fit. What you do today doesn’t have to become your permanent trajectory. Are you getting private comments/replies? If so, what are they saying? How is your traffic on that post? Are you getting public “likes,” comments, re-tweets, and social shares? Are you getting more success with the thing you’re promoting? Is it driving your email list, number of discovery calls, or sales? Look at all of the info to see how your audience is reacting to your changing promotional strategy. Consider this, and pivot if necessary. Embed a few free opt-in incentives throughout my blog posts. I try to keep them relevant to this week’s topic. So, in this post I’ve linked to the download of my content strategy editorial calendar, as well as my “60+ health blog post ideas in 60 minutes” blog post. Both are free. 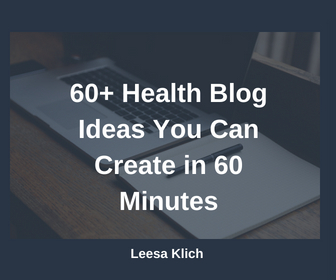 (BONUS MARKS: I created a content upgrade for this 60+ health blog ideas in 60 minutes post). At the end of my posts I include a little promo to follow me on Twitter, my favourite social network. Follow me on Twitter by clicking here. Also free. Then I include a promo for my featured articles as my “tripwire.” These are “done for you” authority-building fully researched health articles. These long-form health articles are easy to read and broken down into subheadings and normally start at CAD$47 each, but there is a featured one for CAD$27. To promote it, I throw a small promo at the end of each blog post highlighting the monthly feature. This month it’s all about green tea supplements for weight loss & sports performance. At the very end, I mention some of my other services, and link to my “work with me” page. Finally, I have an exit-intent pop-up to sign up to download the list of 60+ blog post ideas in 60 minutes (this is a direct link to the content upgrade, not the blog post). On the other hand, last Christmas I made a blog post that was purely promotional. It was a “Healthy holiday gift guide” and contained a bunch of affiliate links to products I love. You can see the gift guide here. There are so many options how you can add some promotion into your blog. There are subtle mentions and sign-up forms. You can embed small promotions or affiliate links, or keep them at the end of your posts. Or you can create a post (or several) that are 100% pure promo. When it comes to what, you can promote free things, like an email list-building opt-in incentive; or even a low-cost item. Ultimately, you can plan a full-on multi-week promotional blog series to strategically promote an upcoming large product or service launch. How does your audience receive them? What do you think? Do any of the ways to use promotion in your blog appeal to you (or repel you) more than others? Have you used any of these strategies? Are you going to try them? What opt-ins, products, or services have you promoted, or plan on promoting on your blog? And, lastly, and possibly most importantly, how has your audience received them? Thanks to The Tech Savvy Coach Sam Duncan for the opportunity to answer some questions on health blogging, content creation, and content strategy. 1) 2:24 – Strategizing your blog posts to support your business is so important! I totally struggle with that and want to know what you suggest… for example, how many posts should promote my services vs. just being informational? – There are 3 things to consider before deciding how to do this. 3) 13:57 – Why you should customize “done for you” content. 4) 16:23 – Shorter vs longer posts. Including a bit on SEO-optimization. 5) 27:05 – How often should we post? How to get content ideas? This was really helpful. I do most of these, although I know I can do them better, whether with better images or better upgrades. I want to offer a tripwire, but I’m not sure what it should be and how to tie it into my blog. Thanks Lynn! The way I think of a tripwire is that it’s a bit beyond a blog post (which is free), but not nearly as much as a paid program or consult. Something you’d be proud to sell for $7 or $17. Perhaps a pdf of a free challenge with a few exclusive videos and recipes, for example. You can always ask your followers what you can help them with, or try putting something out there to see how it’s received. Good luck!